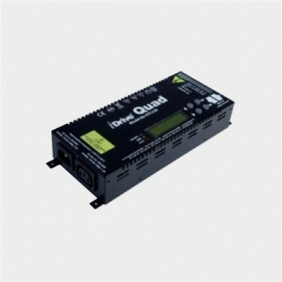 The iDrive Quad is a highly efficient (86-88%)* DMX/RDM compliant product, fully approved to CE61347-2-13, which can be deployed as a 1, 2, 3 or 4 channel driver. Two major benefits of this product are its ability to operate in common anode fixture arrangements and the fact that the channels can be bonded, allowing multiple channels to be wired together to deliver a higher forward current output and greater colour variations, including variable CCT. The iDrive Quad was one of the first high powered LED drivers capable of driving 4 independent LED channels between 350mA and 1000mA and up to 48V DC, approved to CE 61347-2-13.